The Duke Reporters’ Lab is launching a global effort to get more publishers to adopt ClaimReview, a schema.org open standard tagging system or “markup” that search engines and other major digital platforms use to find and highlight fact-checking articles. The ClaimReview project, funded by a $200,000 grant from the Google News Initiative, will include a partnership with the International Fact-Checking Network, the global alliance of fact-checking organizations based at the Poynter Institute. The Reporters’ Lab will develop instructional materials about ClaimReview and assist publishers in adopting a new tool to create the markup more easily with help from Google and Data Commons. The Lab also will work to expand the number of publishers around the world that are using ClaimReview. The IFCN will produce webinars and conduct outreach and training sessions at fact-checking conferences around the world, including the group’s annual Global Fact conference. ClaimReview was developed three years ago through a partnership of the Reporters’ Lab, Google, and schema.org. It provides a standard way for publishers of fact-checks to identify the claim being checked, the person or entity that made the claim, and the conclusion of the article. The standardization enables search engines and other platforms to highlight the fact-checks in search results. 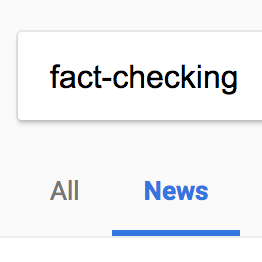 Google and Bing, the Microsoft search engine, both use ClaimReview to highlight fact-checking articles in search results and their own news products. Facebook announced in the summer that it plans to use ClaimReview as part of its partnership with fact-checkers. The Reporters’ Lab uses ClaimReview as a key element in the Tech & Check Cooperative, our ambitious effort to automate fact-checking. Projects such as the FactStream app for iPhone and iPad and a new app being developed for television rely on the markup. Despite the success, the Reporters’ Lab team estimates that roughly half the fact-checkers in the world still are not using the tagging system. Some fact-checkers have found it cumbersome to create the ClaimReview markup in their own publishing systems, while others have been confused about the different options for making it. The new project will help editors switch to the new Google / Data Commons markup tool, a simpler way of generating ClaimReview, and provide technical assistance when they need it.